Great Red Dragon - "Gold Is My Enemy"
"Gold is my enemy, I'm always watching what gold is doing." This quote was from a statement made by Rick Santelli on the Kudlow Show, as reported back on Wednesday, November 18th 2009, at this webpage here. Why would any Fed chairman worry about gold, this old so-called "barbaric relic?" it tells "An Inconvenient Truth." Personally, I think it's because the price of gold serves as a warning that the value of your dollar holdings are being pilfered. What good is a 10,000 DOW over a 1,000 DOW if food, clothing, shelter and energy costs 10 times more. If gasoline cost 25 cents per gallon in the past, and now costs $2.50 per gallon now; and a Camaro automobile cost $4,000 then, but now costs $40,000, how does a 10,000 DOW really show increased wealth? Back then, an auto worker made $3.50 per hour, but does he now make $35.00, which would just be keeping even? Auto workers hired today start around $18.00. If you understand that labor plus raw materials creates wealth, then all other activities that do not contribute value-added are siphoning off, or pilfering, that wealth. So the laborer has less of his wealth to trade with others. That's the real reason the volume of trade decreases. Folks don't understand that having their savings (in cash, stocks, bonds or any other promises valued in dollars) permits pilfering. It is done by Snakes in Suits, quietly creepin' and slitherin' around, doing their lyin' and stealin'. This is not against those who wear suits; just "snakes" that hide in them and pretend to be your friend. They only make up perhaps 1% of the population. They lie about the value of the dollar as they steal millions and more of other people's money. Folks in the know see this reflected in the price of gold. It's how many dollars buys an ounce of gold that determines the value of the dollar, not the value of gold. An ounce of gold, 30 years later, is still an ounce of gold. In the U.S., gold's price is how many dollars does it take today for someone to give up their ounce of gold. If you were to purchase a home of 1,000 sq feet 30 years ago, would you brag today that you're now living in a 10,000 sq feet home? Folks would think you're a nut case. Your home is no bigger than it was when you bought it 30 years ago. A square foot is still a square foot. But unfortunately, a dollar then is NOT the same dollar now. When financial sociopaths say that "gold is their enemy," it simply means that it tends to point out an inconvenient truth. Those who lie-to and steal-from other people need to show that there are more dollars in your account to justify leaving your dollars in their care. They take their fees, earnings and trading profits from these accounts, leaving folks with less real wealth. This five-year chart shows JPMorganChase (JPM), Goldman-Sachs (GS) and CME against GLD. I'm just using GLD as a proxy for the price of gold, as only physical gold in your possession gives you real economic protection. This five-year chart shows the Capital Group's American Funds largest fund, Capital Income Builder A, (52 billion dollars) against GLD. 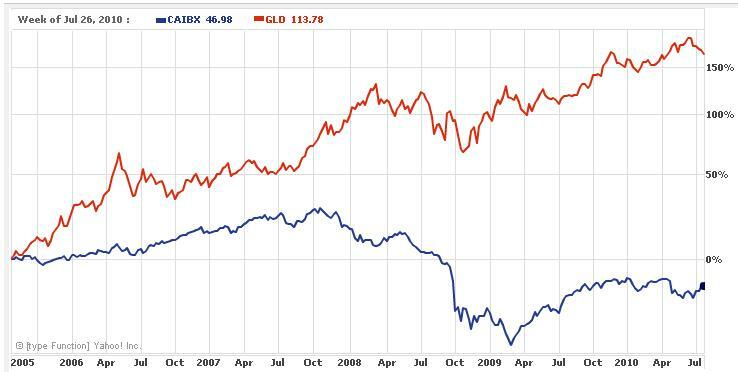 This five-year chart shows highly-esteemed Warren Buffett's Berkshire Hathaway against GLD. Now, which would you rather had owned these last five years! Looks like gold is the enemy of lots of folks. and therefore hold a portion of their wealth in gold (and silver). Will gold and silver repeat this performance over the next five years? I do know that those addicted to OPM (Other People's Money) are just like those addicted to opium. Whatever they can get will never be enough!